Holy smokin’ catfish!!!! where did all the customers go? I think that Sarko should just say he’s very sorry for what happened to the Olympic torch bearer in Paris a couple of weeks ago. 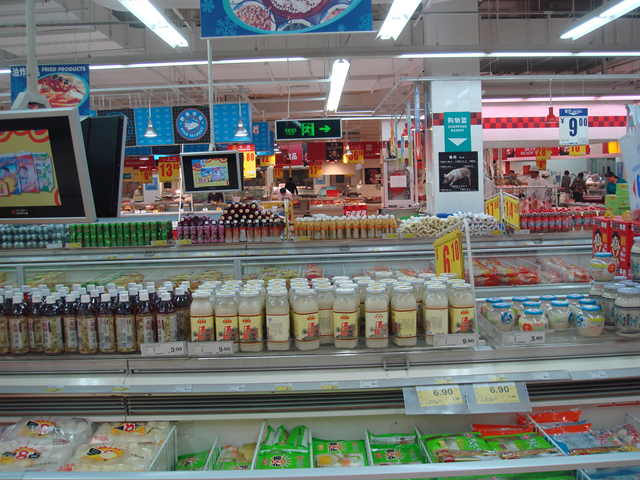 The Carrefour at Zhongshan park is still doing well. Where exactly did you take this picture? 1:00 PM, today, in Xinlicheng Store in Pudong. When Chinese buy stuffs inside China, why should they spent money in foreign-owned department stores? Make your money counts. Stop patronizing all the foreign-owned stores. Let the world understands that Chinese aint gonna be taken for granted no more! Best time to go shopping in Carrefour! 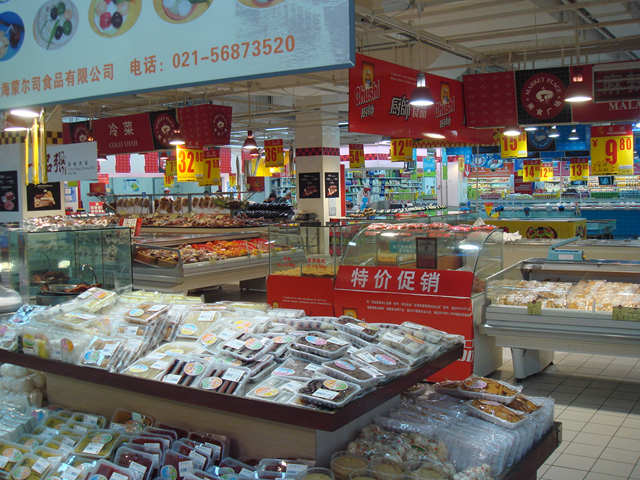 The JinQiao store is not as bad as this – but less people than normal. I want to the same Carrefour at about 8pm in May 1th, it was packed. Thanks for RWM and xge – different time may show different view. To take their observation, you get get a more complete view. LianYang store and Thumb Plaza is bad as well. Did anyone notice that the company put up a notice to explain their stand of fully support the Olympic and denied the allegations about their involvement in politics? And Jin Jin (the paralympic athelete) also stood up and voice her opinion. I agree with her points. 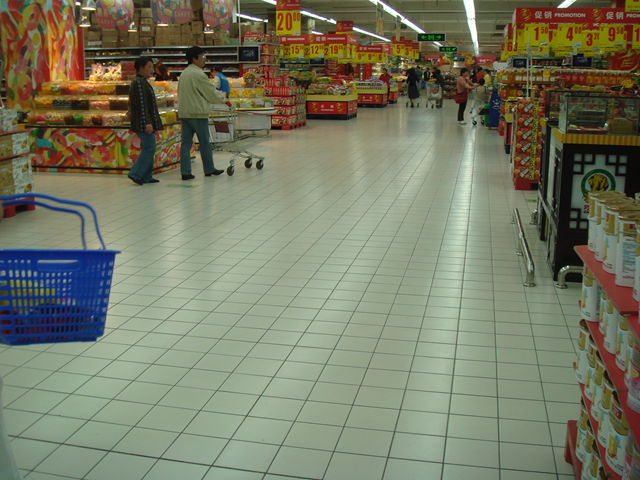 By boycotting Carrefour doesn’t bring any benefits because majority of the goods are Made in China. 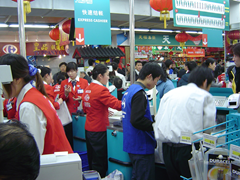 Suppliers are local Chinese farmers and Carrefour employees are Chinese. I am sure the local Chinese suppliers having bad days because their vege cannot sell and let it rot in their farm. The eggs expired on the shelves and no takers. Poor the farmers. There is a carrefour supermarket about 500 meters from my home. After what happened in Paris, none of my familiy memebers went to shopping there. My mother did her daily shopping in Ito Yokado . it takes about 10 minutes ride there, and once a taxi driver offered her a free drive when my mother told him the reason why she refursed to go to Carrefour. Ironically enough, Ito Yokado is owned by Japanese. and it’s widely know that most Chinese are anti-Japanese but pro-france before. 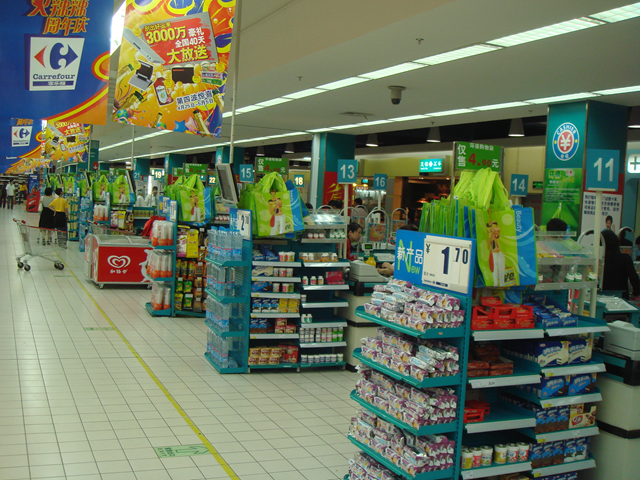 On May 1, we took my 1-year-old nephew to the entrance of Carrefour. We didn’t do shopping there, just to take a picture to let my nephew know that there was such a big change to Sino-french relationship when he was small. 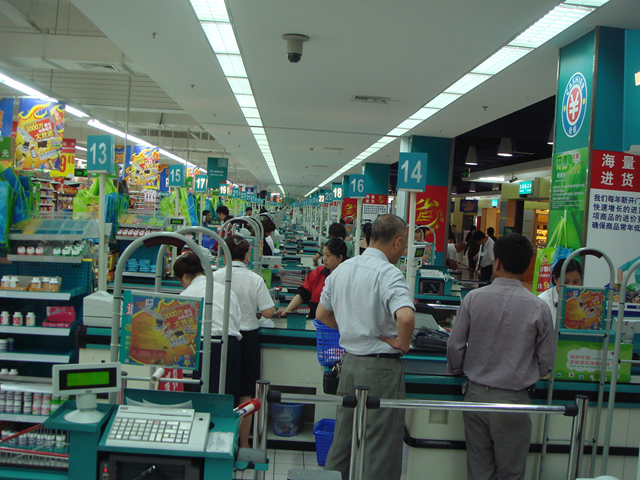 There were still people doing shopping in Carrefour, but compared with normal days, the super market was almost empty, while it is always packed with people during holidays. Personally I don’t think we should go on with the boycotting thing, which brings no benefit to either sides, and it seriously impacts the local suppliers. I think people will gradually started to doing shopping in Carrefour again and ladies will also taking up their lancome lipsticks . It just takes some time to confront the emotional obstacles. Nice photos. 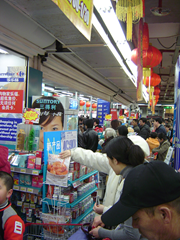 I was in the Shanghai Carrefour in Hongqiao on Wed April 23rd around 5pm and it was packed with at least 200-300 people in the aisles shopping…like any other market in Shanghai. So these photos are pretty shocking. 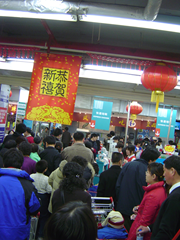 Next time they boycott, they need to tell everyone to go to the store, but only spend 1 rmb….that will be proof of the dissatisfaction of the Chinese consumer. Of course I’m against the humanitarin violations of the authoritarian CCP government, but as a US citizen…lets take care of our own transgressions first before we attack the Chinese people about Tibet……..maybe starting with Guantanamo and Abu Ghraib…..
3. how I manipulated the images by purposely trying to avoid photographing people. 4. how I compare it to a different store at a different time for effect. you have the propaganda methodology down really well. good job! what happened to your blog of yesterday? sorry, my problem I guess, it’s back on now! I dont think this is a good idea, manu chinese will be affected: factories-suppliers and workers. Where’s the logic? Anyone home? Hello? 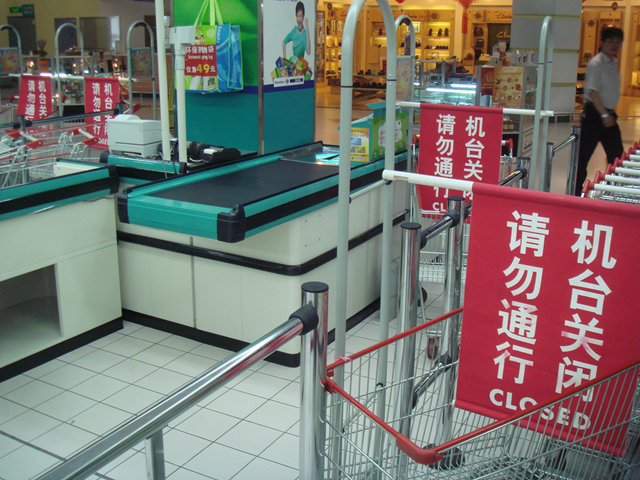 Boycotting the French govnment by not shopping in Carrefours in China doesn’t do anything but harms hundreds of Chinese Carrefour workers and and thousands of Chinese product suppliers in China. Look at it this way: assume in Denmark, for example, some would want to boycott China by not going to Chinese restaurants in Denmark. If that would continue for long, the people in Denmark would end up paying some of the unemployment of the restaurant people there, while it would’t have any impact to China. Instead, what would work is this: Just don’t travel to the country you want to boycott. That would do two things: 1) it would send a message and 2) it would do much less harm in your own country. Why not go further, and stop selling goods to the French? They did not take your camera and delete photos? When we tried to take a photo yesterday they did that. Hope your boycott against Carrefour continues. You have our full support and we boycott them in France, too. 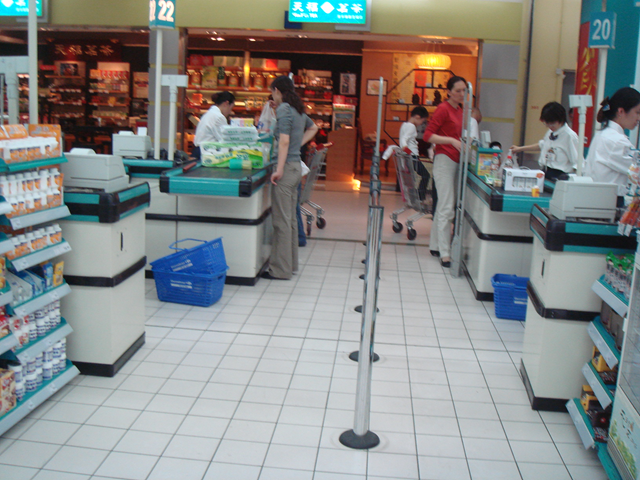 Here is the full story of what happened to us: http://paivisanteri.blogspot.com/2009/04/carrefour-product-service-safety.html. They did ask me not to take photos with rude words. But, I don’t boyscott Carrefour.